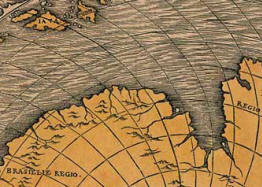 Another well-known map - considered by Graham Hancock and other "mystery" fans as proof positive of Antarctica being already known and charted centuries before its exploration - is the one published in 1531 by Oronce Fine (called Oronzio Fineo, in Italian; or Orontius Finaeus, in Latin), a renowned mathematician who also designed geographical maps based upon his geometrical studies of the various spherical or cordiform projections. 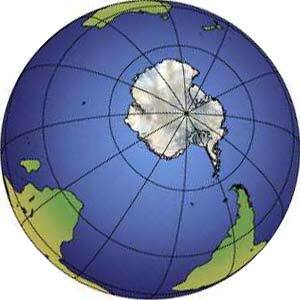 This map represents a large continent called "Terra Australis" (land that lies to the south), around the South pole. 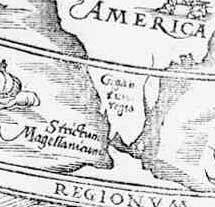 But in this case, too - or, we ought to say, especially in this case - it is evident that the continent, clearly separated from the South America by the Magellan Straits, was not Anctarctica but the depiction of a mythical land, composed by mixing what few morsels of information were then available on the recently discovered lands at the extreme south of the known world. There is in fact many a map showing "Terra Australis Incognita" ("unknown land in the south"), the continent that should have been there, according to the Greek philosophers from Pitagora onwards. They had figured out the Earth to be spherical, and had even calculated its diameter within a good degree of precision (Erathosthenes, in the III century b.C. ), and thought that, being there lands in the northern hemisphere, there should be lands in the southern hemisphere too, lest the world be unbalanced. 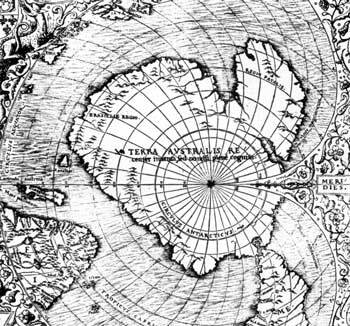 On the myth of "Terra Australis" a great many books have been written, and in all the studies on the history of cartography maps will be found representing the fabulous continent; which is not an ice-free Antarctica, but an imaginary land. 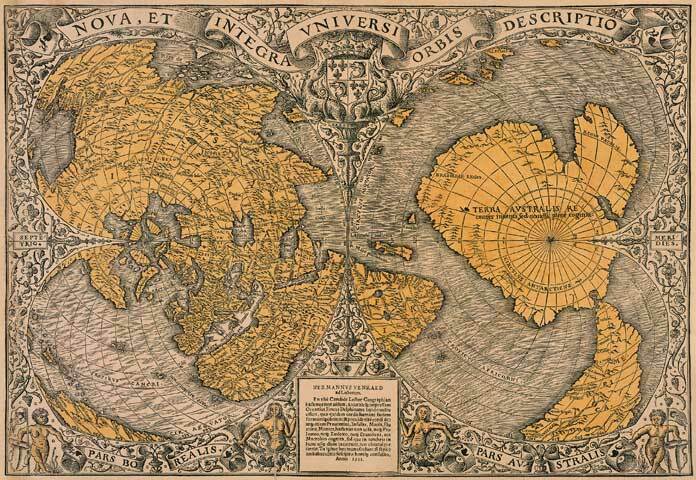 After the first explorations following the discovery of Americas, sailors brought news of new lands being discovered farther and farther south, and this gave strength to the idea of the mythical continent really existing, to the point of it being actually included in many 16-th century maps. 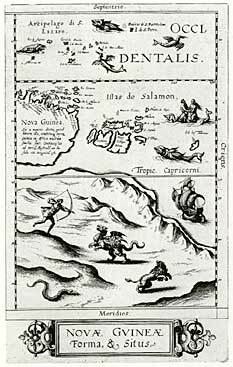 In those maps, as in many others, we see "Terra Australis Incognita", a myth not different from the one of the Garden of Eden (which, too, is often to be found in medieval maps), the Prester John Reign (usually placed in East Africa), or El Dorado. "Terra Australis recenter inventa sed nondum plene cognita", which means "Southern land found recently but not fully known". 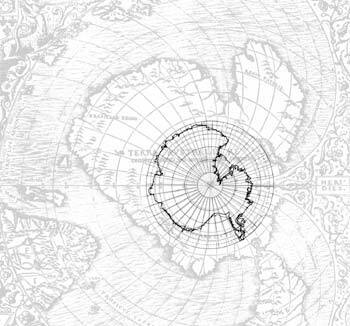 From this, too, we can see that it can't be (as mystery writers suggest) a representation of Antarctica before the ice age, showing as it does mountains, valleys, and rivers, but of lands recently discovered and only partially explored. 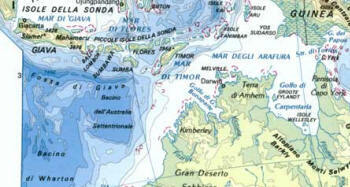 Moreover, the real Antarctica is not near South America, divided from it by the Magellan Straits. Far from it, literally, the austral continent is much farther south, its northernmost fringes being more than 1000 km from the Tierra do Fuego. Finaeus' world map is then an approximate, idealized map where lands only half-seen or skirted by sailors are knitted together to form a great austral continent. And what might have been these lands, so "recenter inventae sed nondum plene cognitae"? Why, one is surely Tierra do Fuego itself, coasted by Magellan in 1520 and thought to be, through all of the 16-th century, the northern fringe of Terra Australis. In describing the region, Finaeus' map doesn't appear much different by so many others of the same period. 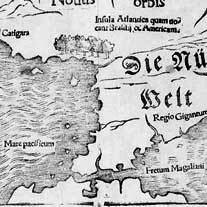 Magellan Strait in the maps of Finaeus, Apian and Munster. 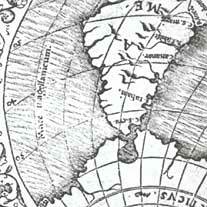 Magellan Strait and the Terra Australis Incognita the in the map of Jodocus Hondius, 1608. But there was another land at the far south of the known world, which, in the first years of the 16-th century, was just beginning to be visited by Portuguese sailors, who had reached the Polynesian archipelago. In Finaeus' map the islands of Java and Timor can be clearly seen, and that great continent dubbed "Terra Australis" and thought to extend up to the Magellan Straits to South America might then comprise also Australia, which is just to south-east of Java and Timor. 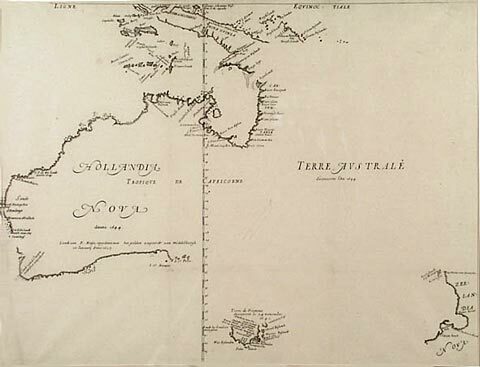 The great gulf depicted in Terra Australis could then be a sketchy layout of Carpentaria Gulf, in which the two islands of Groote and Wellesley are recognizable, or the Bonaparte Gulf, near Java and Timor. 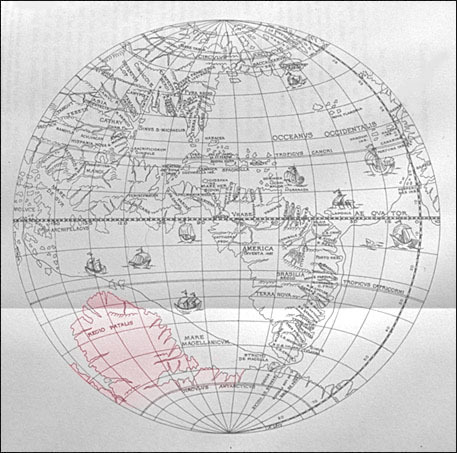 Orontius Finaeus' "Terra Australis" confronted to Australia. In both maps, we find Java (or Giava) at the top left. 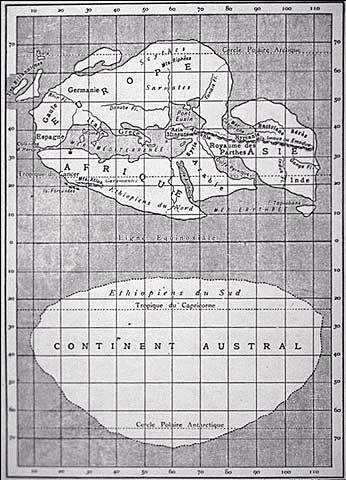 Kenneth Gordon McIntyre, "The Secret Discovery of Australia: Portuguese Ventures 250 Years before Capt. Cook." Sydney, Pan, 1977. 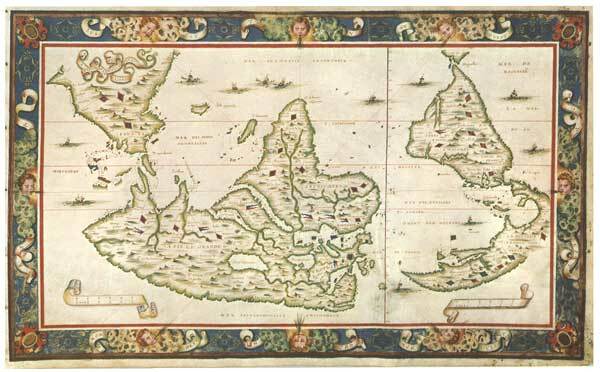 Even in maps from the end of 15-th century we find the Indonesian islands (Java, Sumatra, Borneo, Celebes), and surely many travellers knew about a great unexplored land mass to the south, known to the Chinese and rich in gold and shells. At the beginning of the 16-th century the Portuguese had begun colonizing those islands nearest Australia, that resulted within their jurisdiction. They reached Java and Malacca (1511), then Timor (1515), and probably had also reached the northern coast of a large, and unknown, land. Mendonca's expedition south of Timor dates back to 1522. The sailor left towards the India of the South, cited in many tales of european and chinese voyagers. Cristo de Mendonca came to shore in what at the beginning he though to be a very large island. Upon his return in Portugal, de Mendonca kept the discovery to himself, to avoid it to be exploited by the Spaniards, since the actual position of the border between Spanish and Portuguese areas in the Pacific was, at the time, quite controversial. A large land mass, called "Greater Java", placed south of Java and Sumatra, appears in many 16-th century French maps which quote Portuguese landmarks. They might have been all copied from the same original perhaps stolen from the Portuguese, by the bishop Miguel de Silva. He was accused of illegally smuggling confidential documents: thus maps were considered, since they could supply other nations with vital information for colonial ventures. Desliens map of 1567. The orientation is inverted: Nord is down. At that time, travel and exploration weren't endeavored for sport, or for knowledge's sake. What really mattered was opening new routes and finding exploitable lands, spices, precious metals. But the "Terra australis", so "recenter inventa", long remained "paene cognita", since it didn't offer, apparently, but "sterile coasts, inhabited by few savages so primitive it wasn't possible to reach the vaguest understanding with" ("History of the Explorations" by Ugo Dettore, Ist. Geogr. de Agostini). Australia clearly appears in the 1593 map by Cornelius de Jode, and in world maps dating at the beginning of the 17-th century, but it was only in 1642 that a Dutch, Abel Tasman, sailed south of Tasmania and New Holland (now Australia) and discovered that this land didn't belong to the mythic Southern Continent, but was really a large island. CORNELIUS DE JODE "Nova Guinea"
From "Speculum Orbis Terraum", Antwerp, 1593. MELCHISEDECH THEVENOT "Hollandia Nova", Paris, 1663.